Light bulb manufacturers will cease making traditional 40 and 60-watt light bulbs — the most popular in the country — at the start of 2014. 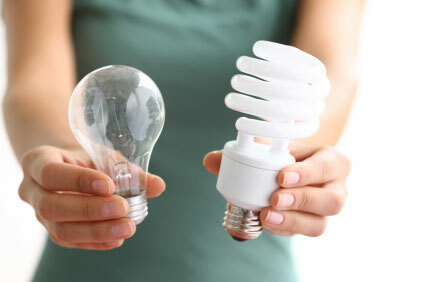 In their place will be halogen bulbs, compact fluorescent bulbs, LED bulbs and high efficiency incandescents. These new types of lights are designed to address gross inefficiencies with old light bulbs — only 10% of the energy they use is converted into light, according to the Environmental Protection Agency, which has a handy fact sheet about the changes. The rest of the energy is wasted as heat. These rules were signed into law by President George W. Bush in 2007. With LEDs, the saving are even greater. While a 40-watt LED goes for about $7.50 — a big drop from the $50 or so it cost just a few years back — it uses 85% less energy than a traditional bulb. Over the course of the year, a LED will consume about $2 in power under normal circumstances, said Mark Voykovik, national light bulb merchant for Home Depot. That compares to over $7 for an incandescent. “In two years, you pay off that bulb,” said Voykovik. And because LED bulbs are expected to last at least 20 years — it’s all savings for the next 18 years.